Under the Microscope is Production Manager, Ed Tomassetti. Heading the team at our Oak Creek facility, Ed oversees the blending, packaging, and shipping aspects of our business. 1. What drew you to Microbial Discovery Group? I was looking for a company that offered a meaningful product/service and cared as much about its employees as financial success. I found that company in Microbial Discovery Group. I’m currently focused heavily on strain, finished product, and ingredient/packaging inventories. I enjoy looking for ways to improve our accuracy and ensure we manage our inventory in efficient ways. We are in the middle of implementing a couple of new ideas, and I’m looking forward to seeing how these changes improve our inventory management. 4. What is the most inspiring or exciting part of your job? 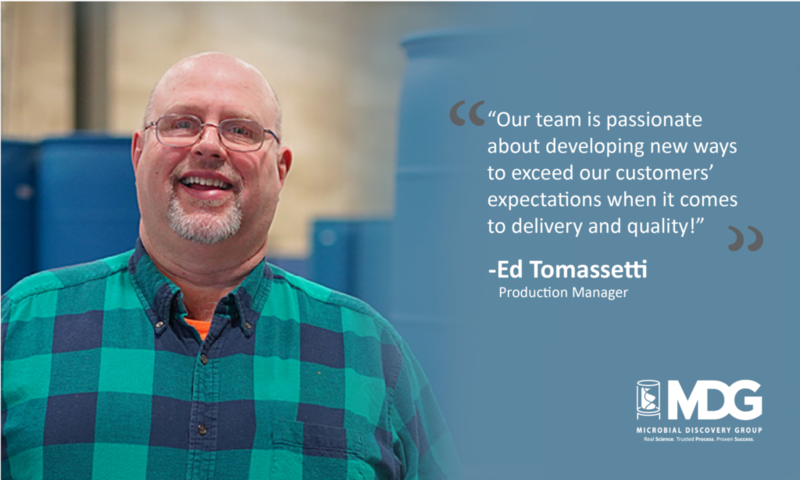 Our team has been working hard at improving our processing efficiencies to minimize delivery time to our customers. We have recorded impressive performance to date and believe we can always be better today than we were yesterday. 5. What is your favorite aspect about working at MDG? I really enjoy learning new things, and MDG has no shortage of things to learn. When I first started at MDG, I always felt like the dumbest guy in the room. With a couple of years under my belt, I still can’t offer brilliant solutions for increasing fermentation yields, but I do understand terms like CFU/g, lyophilization, and supernatant. More importantly, I have learned a few secrets of dry particle blending that have improved our blending efficiency. 6. What do you like to do when you’re not at the office? I am an avid DIY person. We finished up a major remodel of the first floor of our home, just in time for Christmas. This spring I’m looking forward to renovating our laundry room, refinishing our hardwood floors, and more than likely remodeling a bathroom. 7. Professional goal for the next 5 years? I would like to improve our blending and packaging operations in a scalable way to ensure we exceed our customer expectations of delivery and quality. 8. Let’s talk about MDG’s packaging and shipping capabilities. What makes them so special? MDG recently entered the Vertical Form Fill Seal packaging world, producing our own packaged products. Our team rose to the occasion and studied elements of taking on this intricate process. Together, we have been able to experiment by adjusting the environment, equipment, and product. By optimizing these variables, we have seen tremendous success with our own product packaging. Next, we have leveraged that knowledge to efficiently run customer packaging jobs. By choosing MDG to blend and package their products at our facility, customers can minimize the lead time of their product purchases. As for shipping capabilities, our 44,000 square foot Oak Creek facility provides more than adequate storage space to inventory our most popular products. We constantly monitor demand to ensure we are inventorying products our customers want, allowing us to minimize our order-to-ship window.